Hysterosalpingography (HSG) is an outpatient fluoroscopy procedure that evaluates the uterine cavity and fallopian tube patency. HSG is commonly performed as part of an infertility evaluation or after placement of contraceptive micro-inserts. This topic will review the indications for HSG, preparation, technique, and test results. Other methods for assessing the uterine cavity and tubal patency are reviewed separately. 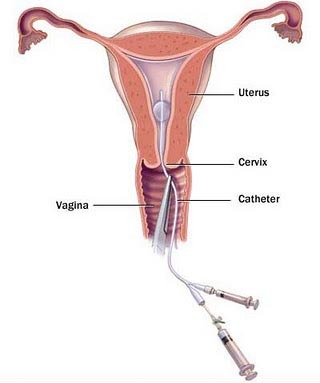 HSG is the evaluation of the uterine cavity, fallopian tubes, and adjacent peritoneal cavity following the injection of contrast material through the cervical canal. It is performed as a real-time outpatient examination under fluoroscopy with iodinated water-soluble radio-opaque material. As HSG assesses fallopian tube patency and intrauterine contour, clinical indications for HSG include evaluation of female infertility or suspected uterine anomalies, pre-procedure planning for hysteroscopy, and post procedure assessment following tubal ligation or tubal reversal procedures. The major contraindications to HSG are pregnancy, active undiagnosed vaginal bleeding, active pelvic infection (even if the patient is receiving antibiotic therapy), and a history of a severe reaction to iodinated contrast. Active menstruation is a relative contraindication. In our practice, we use an algorithm to exclude women with contraindications prior to performing the HSG. Prior to examination, a brief medical history is obtained from the patient to ensure there are no contraindications to the study. Examination indication, the duration of any gynecologic symptoms, history of previous pelvic infections or surgery, obstetric history, contraceptive use, date of the last menstrual period, and prior contrast reactions are discussed. The operating clinician explains the procedural steps and answers the patient’s questions prior to obtaining written consent. Informed consent includes the possibility of pelvic discomfort, vaginal bleeding, infection, contrast reaction, and irradiation of an unsuspected pregnancy Women with indwelling fallopian tube micro-inserts or intrauterine devices are advised about the small risk of implant dislodgement that could require a separate procedure for replacement. HSG can be associated with some discomfort, primarily from uterine distention. Patient movement as a result of pain can increase the risk of uterine perforation or suboptimal images, which can increase the radiation exposure. We advise women to use over-the-counter analgesics such as nonsteroidal anti-inflammatory drugs if bothersome uterine cramping occurs on the days following the examination. Hydrosalpinx is defined as fluid-filled dilation of the fallopian tube and is most commonly caused by peri tubal adhesions.